Now this is almost as good as it could have been. If only Tesco had been a little more cooperative. Since when do they not accept student i.d. cards? I swear that every other time I've gone in to buy a bottle of wine with a friend, they didn't require a driver's license. Unfortunately, I got stuck with the grumpy old troll of a man to ring up my groceries last night. The bottle of Cognac (I would have preferred Grand Marnier, but our itty bitty Tesco is not particularly well-stocked) that would have added a little sparkle to this rode patiently down the conveyor belt, bumping along after eggs, butter, an Aero caramel bar, a loaf of bread, and some white chocolate. He took one look at me and immediately demanded, "D'ya have some i.d. on you?" I whipped out my card, only to be shot down with a grumble about students and a shake of the head. No matter though, as this was still incredibly delicious. 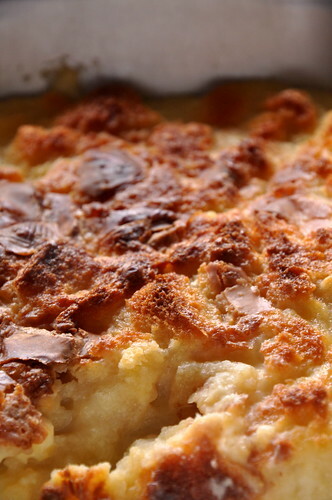 The Grand Marnier or Cognac would have rounded out the flavors, but you still can't argue with a custard-soaked, white chocolate-laden, toasty-on-top bread pudding. The recipe for this is more of a formula than anything else. Working with Nathalie this summer, baking biscuits all day long, left us with a ludicrous amount of uneaten and moderately stale biscuits. They were good to begin with, so, of course, we wouldn't want them to go to waste. We turned them into panzanella, we blended them into soup, we even crumbled them and mixed them with butter for the crust of a savory tart. 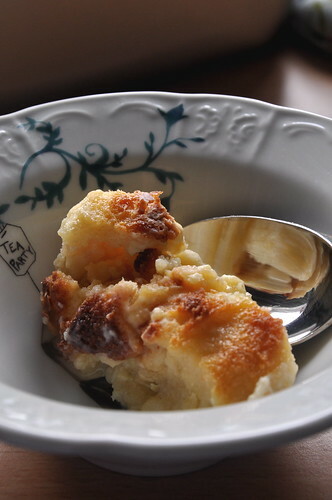 The best applications, though, were the bread puddings. Julia, Nathalie, and I played around with every combination of flavors we could think of. Cinnamon raisin. Ginger banana. 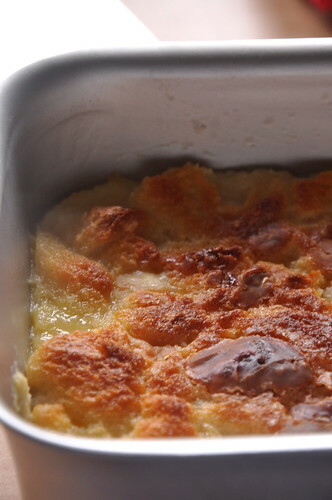 Anything that struck us as tasty went into the bread pudding. To my surprise, my favorite turned out to be the white chocolate-Grand Marnier variation. I'd never loved white chocolate, but, as the blueberry white chocolate tart proved, I do enjoy a little bit every now and again. Play around with this recipe or make it as I have written here; you won't be sorry. Preheat the oven to 350 degrees. Butter the inside of a 9-5-inch loaf pan. Whisk together the milk, sugar, eggs, vanilla, and Grand Marnier. 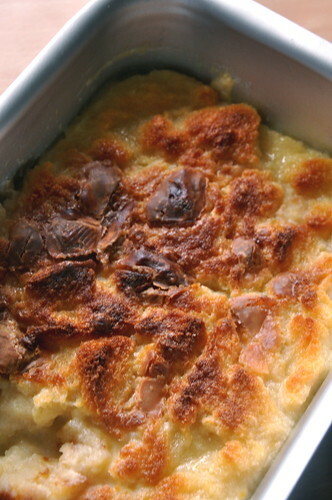 Add the torn bread to the custard mixture until there is little extra liquid lurking in the bowl. Fold in the white chocolate. Bake for 1 hour, or until a knife inserted in the center comes out clean. Serve warm, drizzled with butterscotch if you have it!